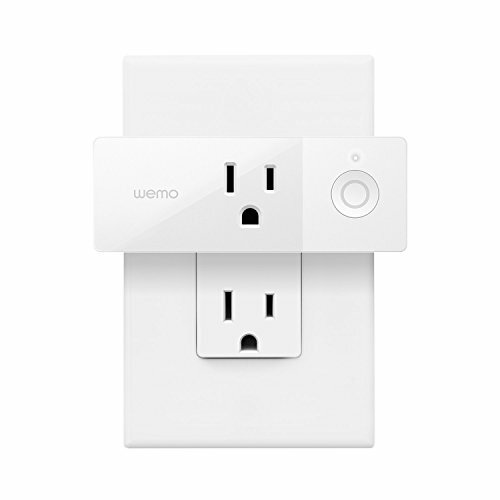 Featuring a sleek new form-factor that allows you to stack two Mini Smart Plugs in the same outlet, the WeMo Mini gives you control of your lights and small appliances whenever you want, wherever you choose, with tons of options for scheduling and automation. Paired with Amazon Alexa, you can control your lamps and appliances with just the power of your voice. When WeMo works with Nest Thermostat, you can set your lights to turn off automatically when you leave the house. [Voice Control] Gosund Smart Switch works with Amazon Alexa, Google home. With Gosund Smart Light Switch, you can turn on/off your light with your voice. [Remote Control] Control your devices from ANYWHERE with your mobile phone. No need to control it manually. 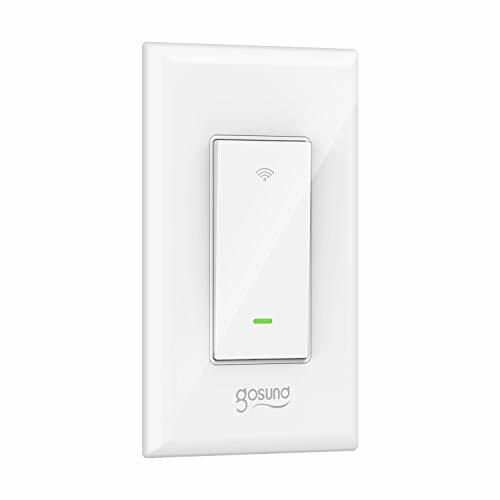 [Time Schedule] Gosund Wall Switch with Timer removes your worry about forgetting to turn off your devices. Set time for Evening. Then never back to a dark house. [Device Sharing] Share your device to your family members. Smart Switch makes your life smart and easier. NOTE: FOR 2/3/4 GANG SWITCHES, AS OF NOW IT IS NOT COMPATIBLE, PLEASE DO NOT PURCHASE. NOTE: NEUTRAL, LIVE, LOAD WIRES ARE REQUIRED TO POWER SWITCH. WITHOUT LOAD/NEUTRAL, PLEASE DO NOT PURCHASE. Works in a single-pole setup only. Easy and safe installation. Cut off power before installation. 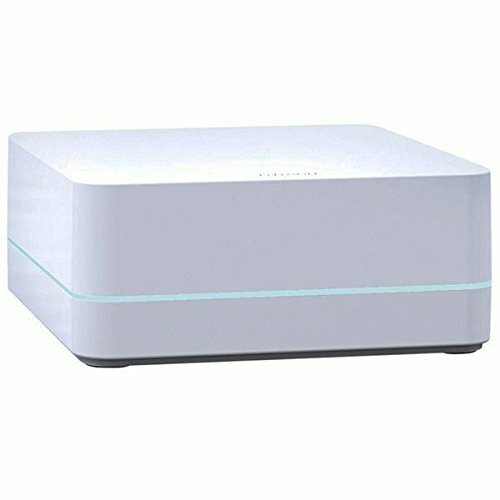 Support wifi 802.11 b/g/n 2.4 GHz wireless network. Just download free APP Smart Life to control. Support IOS8.0 and Android 4.4 above. Gosund smart switch is backed by 90 day unconditional full refund guarantee and 12-Month limited warranty. Works with all LED, CFL, halogen, and incandescent bulbs and other devices. It must be connected to a supported hub in order to interact with the Amazon Alexa. Requires in-wall installation with hard-wired connections - Neutral wire REQUIRED. Includes white and light almond paddles (wall plate not included). 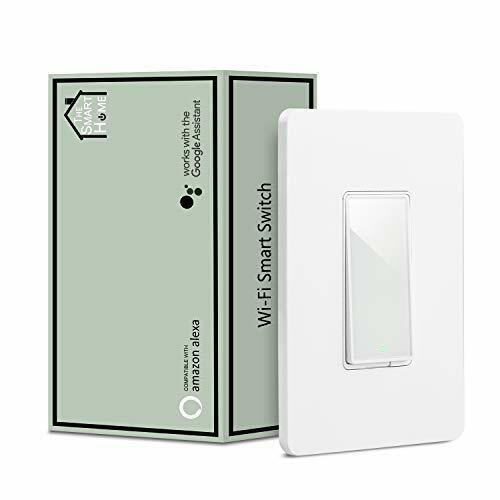 Easily replace your existing single pole or multi-way switch with the new Leviton 15 Amp Universal LED/Incandescent Decora Smart Wi-Fi Switch to allow control from anywhere. 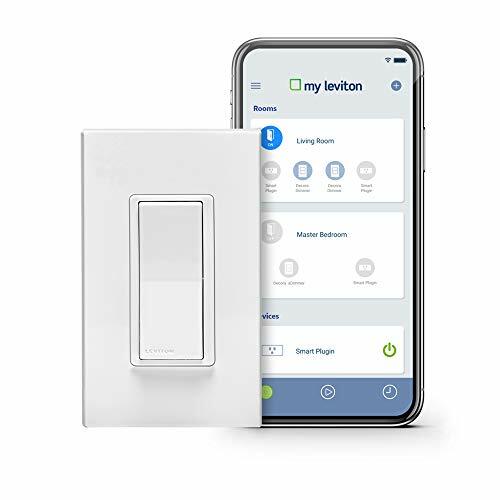 Use the free My Leviton iOS or Android app to add/name devices and to control them individually or as a room with a single button push. Create schedules, scenes and customize your experience as desired. Add an Amazon Alexa or Google Assistant device to use voice commands like, "Alexa, turn outdoor lights on . Leverages the Leviton Decora form factor with matching color change kits, multi-way devices, wallplates and more. Rated for LED and CFL loads up to 600-Watt, incandescent loads up to 1800-Watt or fluorescent loads up to 15 Amp, neutral wire required (a neutral wire provides continuous power to the smart switch and is required for functionality. If you have questions, please contact Leviton directly or consult a licensed electrician). A 5-year limited warranty supports Leviton Decora Smart Wi-Fi products. Decora Smart devices are designed for countries which follow NEMA standards including the United States, Canada and parts of South America. 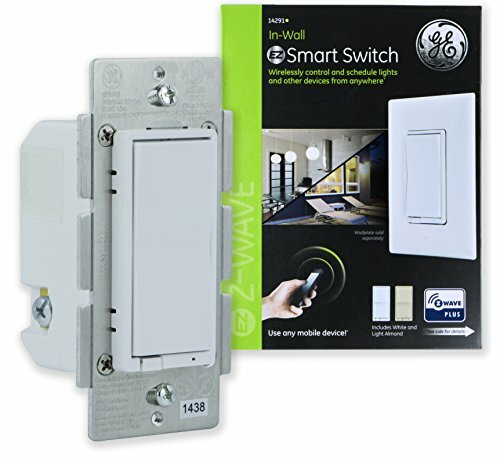 DW15S is for use with the My Leviton app and can be connected to voice controls and select third-party devices. If enrolling into a hub like Samsung SmartThings to create a complete smart-home eco-system, Leviton recommends the DZ15S. If using in a HomeKit installation, utilize the DH15S. ---------------- Q1: Will it work with Both my Echo and Echo Dot? A1: Yes. Q2: Can I use it if I do not have an Echo? A2: YES, you can still use App to control it. Q3: What's the requirement of my wireless WiFi? A3: This works with 2.4G WiFi only. Not compatible with 5G WiFi. Q4: How Can I set up this plug? Are there any instructions? A4: It's very easy to set up. You can find a step by step User Manual in the box. Q5: Is this switch safe? A5: The switch is passed the FCC test and fuse is used. Please note the Max Load requirement above. About us: We have more than 10 years of experience in the design and manufacture of cell phone and computer accessories. We have produced best-selling iPad and iPhone accessories for several well-known brands. Now operating under our own brand name and from recently updated manufacturing plants Martin Jerry offers buyers fashionably designed products, excellent quality materials, competitive price and fantastic customer service. Specifications: 100-240V, 15A(Max), 50/60Hz. This wifi smart switch can work in most household electricity environment. Looking to add a little sophistication to your home? Lutron Diva Switches are a perfect replacement for your existing designer opening switches. The large paddle turns the light or fan on and off with just a push of your finger, making it easy to use for people of all ages. Pair with a Lutron Diva Dimmer for control of the lights or a Lutron Diva Fan Control to increase your comfort level. This switch works in single pole applications, where the light or fan is controlled from one switch. These switches are available in 7 gloss colors, allowing you to coordinate and customize specifically for each room in your home. Experience the ultimate convenience in lighting control with Lutron family of Caseta wireless dimmers, switches, and smart phone control. The Caseta wireless in-wall switch provides switching of multiple load types and, when paired with Pico remote controls, allows remote control from anywhere in the space. Use the Pico remote control either in your hand, on a tabletop pedestal or by mounting the remote directly to the wall (remote control and accessories sold separately). you can even use the Pico remote to control the lights from your car as you arrive home. This switch works with up to 720 watts of incandescent, halogen, Elv and mlv, 6 amps of dimmable LED/CFL and 3.6 amps of general purpose fans. Operating voltage: 120 V~ 50/60 Hz. NEUTRAL WIRE REQUIRED. Coordinating wall plate sold separately. Brand: Lutron | Manufacturer: Lutron Electronics Company, Inc.
Switchmate automatically turns on lights as you arrive home or enter rooms and is installed through a simple one-second installation, so everyone can enjoy the many benefits of smart lighting without the hassle of complicated set ups. It is the first smart home product that can be use with absolutely no configuration, tools, wiring, or wifi. Switchmate instantly attaches magnetically to existing toggle or rocker switches and is controlled through the free app on your smart phone. Always makes it look like you are home for enhanced security with Switchmates timers that automatically turn your lights on/off, and function even when you re away from your home. 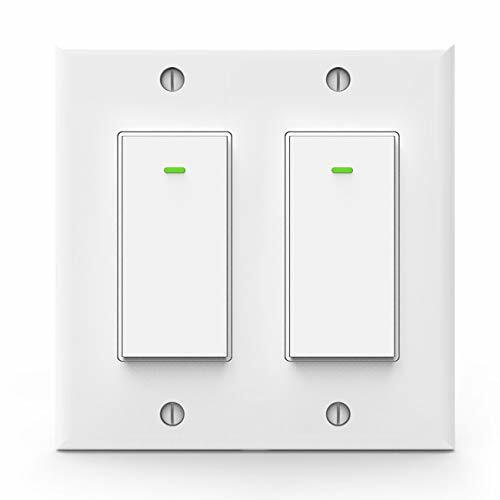 Switchmate instantly modernizes old, outdated light switches and transform in-home d cor, which can be conveniently moved around the home or taken when you relocate. Just snap, tap, and start enjoying smart lighting simplified with Switchmate. 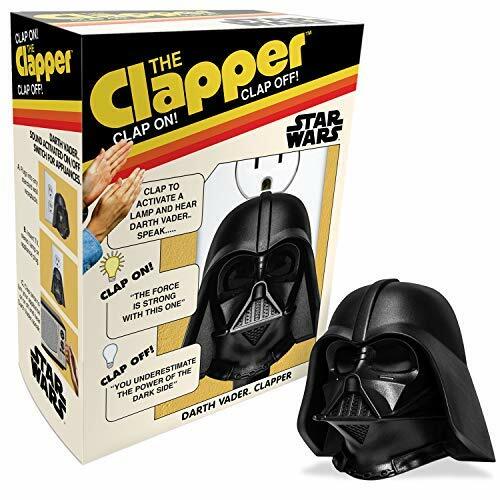 The original and affordable home automation - now comes Darth Vader Clapper! Turn on or off your appliance (such as a lamp) by clapping your hands! Hear Darth Vader speak "The Force is Strong with this one".Clap twice again and hear Darth Vader speak "You underestimate the power of the dark side". Clap twice again (to turn off) and hear Darth Vader speak You underestimate the power of the dark side. 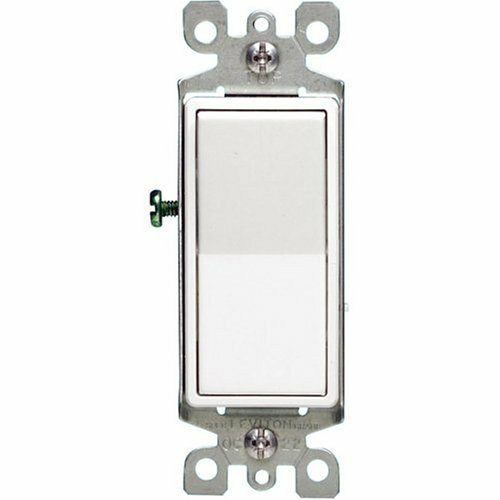 Brand: Clapper | Manufacturer: Joseph Enterprises, Inc.
Leviton rocker switch, grounded, series: Decora, 120/277 V, 15 a, contact configuration: 3-way, AC quiet, 1 poles, wall mounting, quick wire push-in and side wired terminal, -40 to 120 deg c, 1.4 in overall width, 1.38 in overall depth, thermoplastic, white, CSA file lr-3413, UL file e-7458, Nom 057, steel strap, 1/2 hp at 120 V, 2 hp at 240 - 277 V. Leviton rocker switch, grounded, series: Decora, 120/277 V, 15 a, contact configuration: 3-way, AC quiet, 1 poles, wall mounting, quick wire push-in and side wired terminal, -40 to 120 deg c, 1.4 in overall width, 1.38 in overall depth, thermoplastic, white, CSA file lr-3413, UL file e-7458, Nom 057, steel strap, 1/2 hp at 120 V, 2 hp at 240 - 277 V.
"Experience the ultimate comfort and convenience with the NEW Caseta Wireless Smart Fan Speed Control. This fan control gives you the ability to turn your fan on/off or choose between four speeds for increased comfort. Eliminate your pull chains - use with the wireless Fan Pico remote (PJ2-3BRL-GXX-F01, sold separately) for control from anywhere around your home. 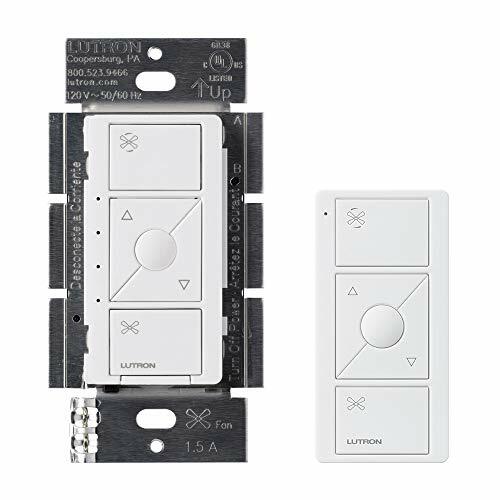 For increased versatility, add the Smart Bridge (L-BDG2-WH, sold separately) and use with the FREE Lutron app to set up your favorite scenes and create schedules based on time of day. Integrate with other Smart Home brands, including Alexa, Apple HomeKit, the Google Assistant, Nest and more. Coordinating wallplate sold separately." 1. Neutral wire is required. 2. Support 2.4GHz Wi-Fi Only, not support 5Ghz wifi. Smartlife App - Device - Menu on the upper right corner - check for firmware update. 5. ALL devices and iPhone and Alexa devices need to be on SAME WIFI. 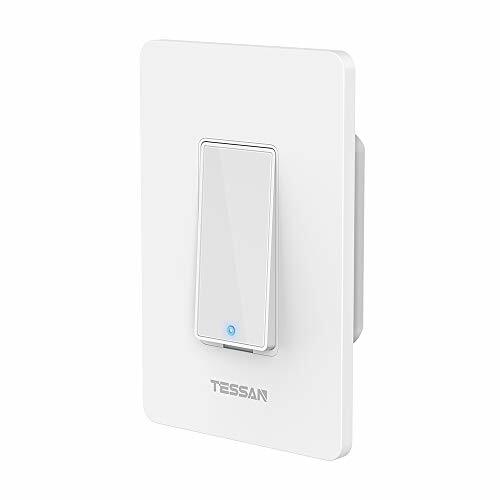 The wall light switch MSS510 Upgrade Version can be controlled from anywhere (Internet Required) with your Meross app (iOS 9.0 or higher, Android 4.1 or higher). It allows you to turn the connected lights or fans on and off, and to set schedules or auto-off timer routine around your daily needs. Additionally, after pairing with Amazon Alexa or Google Home, you can simply control the connected devices with voice commands. MSS510 Upgrade Version with smaller size, fit perfectly for US and Canada standard junction boxes, either 1 Gang or 2 Gang or 3 Gang or even 4 Gang. Single-Pole only, does not support 3 way switch. Neutral wire is required for the installation. The MT7682 chipset, is much better than normal chipsets, greatly enhance the wireless stablity and wifi signal connections. For very rare dropouts, it will reconnect itselfs. No hassles at all. Support sunrise and sunset setting. Moreover, with the clearly designed setup wizard in Meross app, the wiring process has never been easier. Finally, MSS510 operates using Wi-Fi. You can simply connect it to your existing home Wi-Fi without the need to purchase an extra hub. Neutral wire is required for the installation. Voice Control: Works with Amazon Alexa, Google Assistant and IFTTT. Simply use your voice to control the light. Samsung SmartThings and NEST compatibility will be supported soon. Wireless Remote Control: Control the connected lights and fans from anywhere by the meross app on your smart phone. Added benefit of saving energy when lights are not needed or are left on by accident. On/off Schedule and Auto-off Setting: You can schedule the switch to turn on and off automatically or remotely using the Meross App (iOS 9 or higher, Android 4.1 or higher). Support sunrise and sunset setting. This gives the appearance of someone being home. Excellent Quality: The MT7682 chipset is much better than normal chipsets, greatly enhance the wireless stablity and wifi signal connections. For very rare dropouts, it will reconnect itselfs. Product shell made of flame retardant PC materials, FCC, ETL certified. Built-in 15A relay from famous brand WRG. Upgrade Version: With smaller size, fit perfectly for US and CA standard junction boxes, either 1 Gang or 2 Gang. Neutral wire is required for the installation. Single-Pole only, does not support 3 way switch. Experience the ultimate comfort and convenience with the NEW Caseta Wireless Smart Fan Speed Control with Fan Speed Control Pico Remote. This fan control gives you the ability to turn your fan on/off or choose between four speeds for increased comfort. Eliminate your pull chains - use with the wireless Fan Pico remote for control from anywhere around your home. Add the Smart Bridge (L-BDG2-WH, sold separately) and use with the free Lutron app to set up your favorite scenes and create schedules based on time of day. Integrate with other Smart Home brands, including Amazon Alexa, the Google Assistant, Nest, and more. Save your preferred ceiling fan speed with the "favorite" button in the center of the Pico remote for added convenience. Add a point of control where you need one most - used as a hand-held remote, on a table-top pedastal, or mounted on the wall. Coordinating wallplate sold separately. 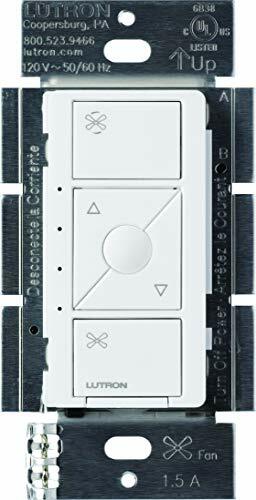 The Lutron pd5wsdvwh is an in wall on/off switch from the Caseta wireless line of control products. It's compatible with many different load types, including 600W incandescent and ELV loads, 600Va MLV loads, 5a LED/CFL lighting loads, and 3a general purpose fans. The Caseta line uses 434 MHz communications to operate. 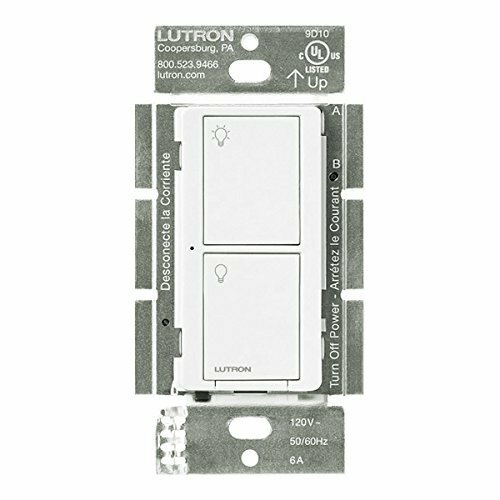 This Lutron Caseta in wall light switch features a fast installation that usually takes about 15 minutes. It comes in a white finish and mounts easily on the wall, perfect for retrofit applications. Once installed, it provides easy control over the lighting, Fan, or other load in the room through its 2Button interface. 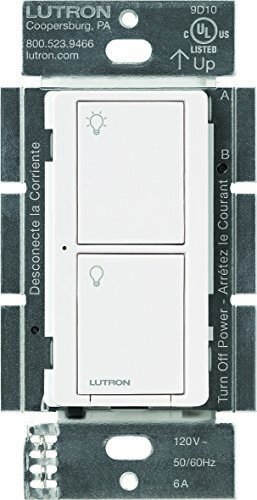 This dimmer uses the clear connect system to wirelessly connect to other Lutron Caseta wireless products. 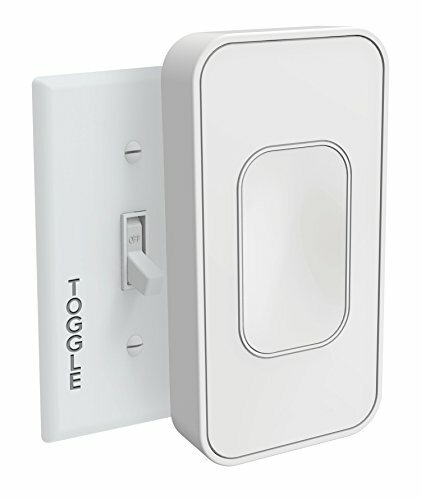 This allows connected lighting to be controlled by the tiny Pico remote, which is sold separately. 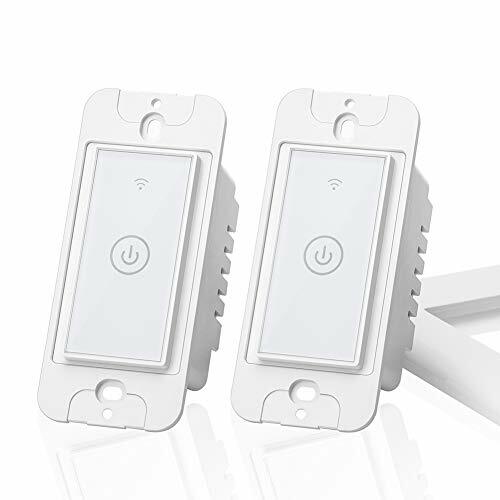 This remote can also be mounted on the wall and synchronized with this dimmer, allowing for multiple points of access in the room. 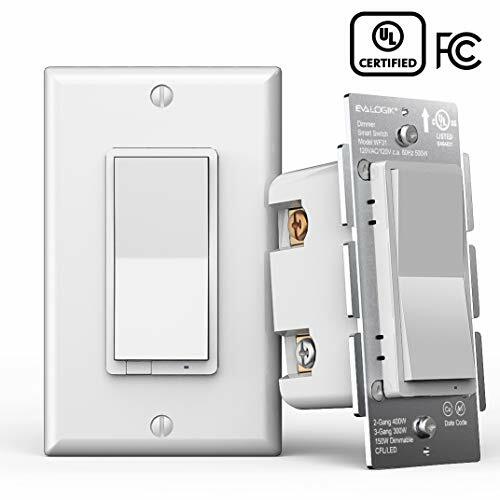 Controls wall and Ceiling lights doesn't require a Neutral wire minimum load cap included (for switching LED, CFL, and ELV loads), Claro wall plate (pictured) sold separately. 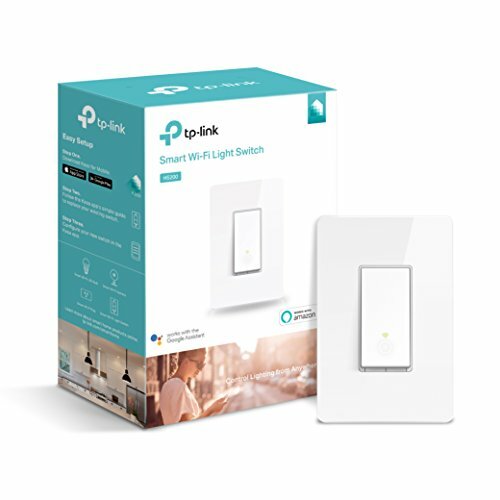 EVA LOGIK Smart 3 Way Dimmer Switch is designed to provide easy on/off and dimming control of incandescent, and dimmable fluorescent and LED lighting. Not only does it allow for manual control, but also remote. Direct 3-Way Solution: Work with regular 3-way switches, no special companion switch needed! PROVIDES BEST DIMMING CAPABILITIES, provides the best dimming capabilities for any lighting that has a dimmable feature, Works with most popular dimmable LED, CFL, halogen. NOT for use with non dimming bulbs. Make sure the load you are about to connect does not exceed 500W for incandescent lights or 150W for DIMMABLE CFL or LED, not less than 5W for LED bulbs. Adjust brightness from 10-100% to cut energy costs and extend bulb life. Remembers last dim state after a power outage. Our switch are UL, FCC certified, meets strict requirements for safety and efficiency, features transient surge suppression built-in, ensuring saftety and reliability with the user experience. Simple Manual Control The switch can be used as a normal light switch, you can turn on/off the light, long press to adjust brightness. IMPORTANT: Must have Neutral Wire for this to work- please check your wiring prior to purchasing. Direct 3-Way Solution: Work with regular 3 way switches, No special companion switch needed! Remote App and Manual Control, On/off and Smart Dimmer Switch, Set Schedules, Run Timers. Voice Control: Work with Alexa, Smart Home. UL Listed, FCC Listed. Only single and 3 way, not support 4 way! This smart switch would connects to your existing home WiFi network easily to provide wireless control of your lights with no hub or bridge required. Whether you're shopping on the market, meeting in the boardroom, you'll be able to remotely control your home lighting from anywhere. You need 3 wires (Live wire, Load wire, Neutral wire) to install this switch. 1.Attach the neutral wire(white) in the electric box to the neutral wire(white) from smart switch. 2.Find out which wire goes to the lights and attach it to the load wire(brown) from smart switch. 3.Attach the Live wire(black) in the electric box to the Live wire(black) from smart switch. 4.If you have ground wire(green/copper)in the electric box, attach it to ground wire(green) from smart switch. 1. Download "Smart Life " App and register an account. 2. Turn on power ,make sure the switch indicator light (Blue) flashes quickly. If not, press the main button and hold it for 5 seconds. 3.Tap + to Add a device in your App (Smartphone should connect to 2.4GHz Wi-Fi). In Amazon Alexa app, click "Skills" > search "Smart Life" app > click "enable" > Log into your smart life account and click "Link now" > When finished, ask Alexa to discover device. It will find your named wifi light switch and now just give voice command to turn on/off lamp. Neutral Wire Required: Most old house don't have a real neutral wire. If you not sure which wire is neutral wire, please kindly take photos of which wires your old switch used, and all wires in the electric box, mail to us for a technical support. Please Note, this smart light switch is NOT a dimmer. Voice Control: Our wifi light switch works with Alexa , Google Home and IFTTT. You can voice command it when you are carrying heavy shop bag, holding a baby or just don't want leave your cozy bed. 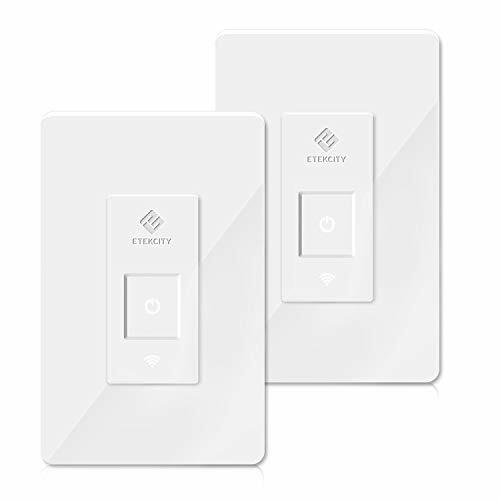 Easy To Install: Our smart switch is designed based on the standard box size, fit with 1/2/3/4 gang box, you can install it as easily as a traditional light switch. It works with all SINGLE-POLE connection lights (Not Support 3-way). Compatibility: This alexa light switch can only connect with 2.4G WiFi ONLY, NOT Support 5G WiFi. You can find all screws and connectors on box. If you have any issues with install and wifi connection, please mail to us for technical support. If our smart light switch does not suit for you, we will full refund of your purchase. NOTE: The 3-way light switch requires a secured 2.4 GHz WiFi network and a NEUTRAL wire. ETL and FCC listed, Enjoy 2-year buyer's assurance and lifetime support from our friendly customer support team. CONTROL FROM ANYWHERE: Thanks to the VeSync app, you can control your 3-way light switch through phone from anywhere. Whether you're already lying down, or you're coming home late at night. 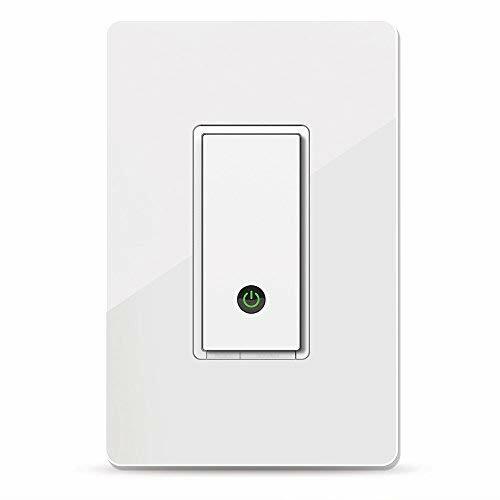 WORKS WITH ALEXA AND GOOGLE HOME: Compatible with Alexa and Google Home, the 3-way light switch lets you easily control your lights via voice command. Convenient when your hands are full, or you're far away from your light switch. 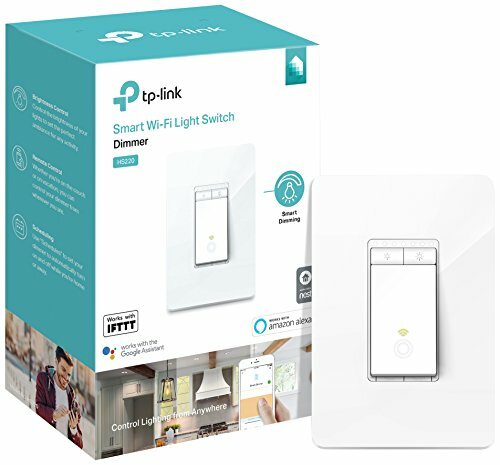 STEP-BY-STEP GUIDE: Watch our step-by-step guide video to install and configure the smart light switch easily. Note: For hardware installation, only install the smart light switch if you are comfortable with electrical work. SCHEDULE & TIMER: Set schedules and timers to turn your lights on or off. Keep your home on your schedule, and enjoy the convenience of hands-free control, home automation starts now. How to solve the unreliability of sound control is always a difficult problem. Sound control is very susceptible to noise and its applications are mostly limited to toys or crafts. Now you have the Poniie PN360 Sound Activated Switch! This product uses the newest smart chip in combination with a high quality sound sensor to receive and analyze the sound signals, which makes it possible to distinguish the two-clap sound among the different types of sound signals. 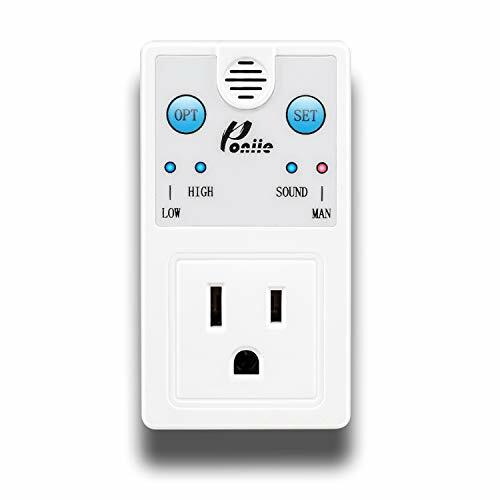 This product is a perfect tool for Home, Kitchen or Bedroom use, controlling lights or appliances that simply turn on when the power is applied. 1. Clap On, Clap Off, very easy to use. Note: The control range depends greatly on the surrounding condition, sensitivity setting and the objects between you and the PN360.